It’s 10 a.m. on a bright, sunny morning in Newark, California, but in the windowless control room at ShotSpotter the lights are dimmed. Two operators are watching banks of displays connected to a network of acoustic sensors located in cities across the U.S.
An alarm sounds on one computer and a red alert box pops up: “Backfire. View incident?” it asks the operator. At her console, the operator can listen to recordings collected from several sensors located within a few hundred meters of the noise, which the computer has classified as a car backfiring. The operators here have listened to thousands of such recordings and, to her trained ears, the sound—more of a pop than the roaring bang we’re used to hearing in movies—is in fact a gunshot. She clicks a button to reclassify the sound and within seconds a report with a location of the shot is despatched to the Oakland Police Department. Oakland is one of 74 cities across the U.S. that subscribe to the ShotSpotter service, provided by Newark-based SST. Other customers include Milwaukee, Minneapolis, Boston, Washington, D.C., and San Francisco. The alerts they get pinpoint the location of the gunfire to within 10 meters, indicate the number of shots fired, take a guess at the type of firearm used and, if the shot was fired from a moving vehicle, provide the speed and direction of travel. It’s all useful information for responding officers, but that last piece of data can be especially important in attempts to catch suspects, said Mikail Ali, a commander with the San Francisco Police Department. ShotSpotter is based on networks of acoustic sensors that are installed across the subscribing towns. The sensors and their associated electronics are housed in small, unassuming metal boxes that don’t look out of place mounted on utility poles or on the side of buildings. “We distribute a large number of these sensors, approximately 15 per square mile, through an urban area,” said James Beldock, SST’s senior vice president of products. The microphones are always listening and the system is designed to trigger on impulsive sounds—very short bursts of wideband audio that include gunshots but also things like cars backfiring, fireworks and hammer blows. “When a gun is fired, the sound from that gun radiates out ... and reaches each one of those sensors at a slightly different time,” he said. The time differences are used to triangulate the location where the sound occurred. It takes about 10 seconds for the triangulation to take place, after a computer algorithm has helped to dismiss things like echoes from nearby buildings. “Sound echoes are the single biggest technical challenge for a technology that attempts to locate individual noises over many, many square miles,” said Beldock. Subscribing police departments usually end up with a much more detailed picture of gunshots across a neighborhood or city. 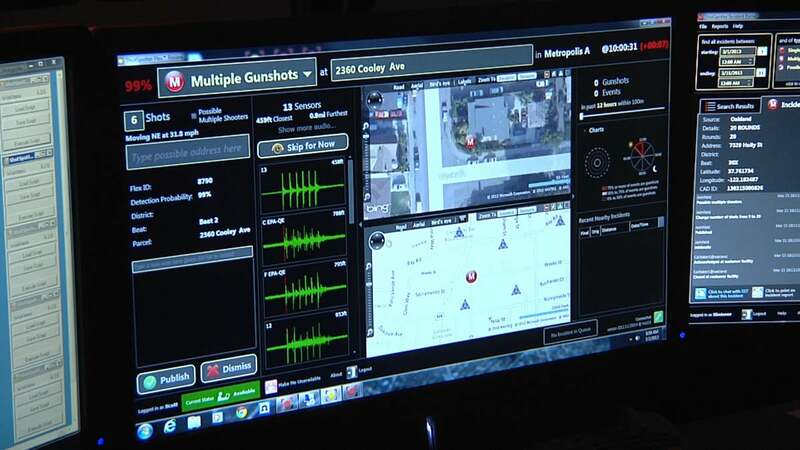 With ShotSpotter, the San Francisco police has discovered that only about 10 percent of gunshots taking place were actually reported by the public through 9-1-1 calls, said Ali. 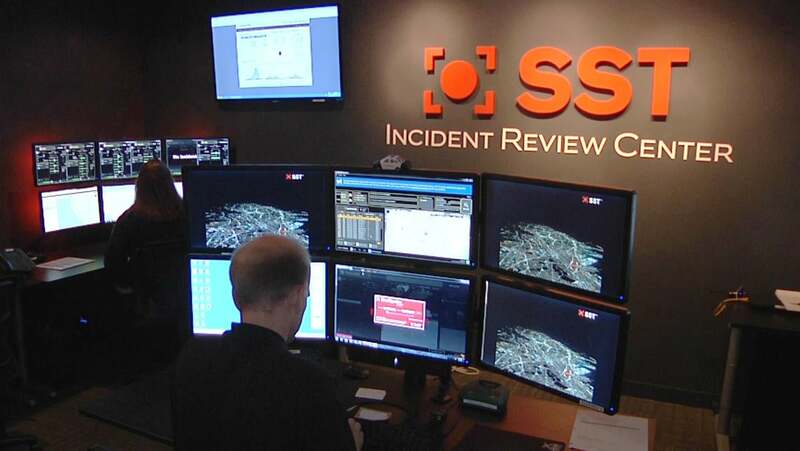 SST guarantees its system will detect and locate 80 percent of outdoor gunshot incidents within its coverage area—except those fired at point-blank range or from guns fitted with silencers—and says the figure is typically as high as 90 percent. Police departments in the San Francisco Bay Area, including those in San Francisco, Oakland, Newark and East Palo Alto, seem satisfied with the system. In the U.K., the West Midlands Police said a deployment there resulted in “technical difficulties”—mainly missed gunshots and false positives. SST responded that several of the missed shots were actually outside of the system’s coverage area, and two involved guns the system has difficulty detecting—an air gun and improvised gun. The lower incidence of gunfire in the U.K. also means the rate of false positives is higher than in the U.S. The use of ShotSpotter is now being expanded beyond gritty urban streets into a completely new environment: the savannas of South Africa. SST has started a trial of its system to detect gunshots from poachers, Beldock said. The sound of a gunshot travels about twice as far in a savanna or even a jungle as it does in a town, so the density of sensors can be reduced. It’s too early to gauge the success of that project, but the hope is that it will serve as a deterrent to poachers or help catch them. Police in San Francisco also expect the system to act as a strong deterrent.